SoCal Pro Rider was set up in 2015 by veteran motorcyclist Jason Humphries with the aim of addressing the serious shortfall in quality, advanced rider training and education in California. Having experienced first-hand the woefully inadequate qualification and training requirements for a motorcycle license from both the California DMV and the CHP Motorcycle Training Course, and seeing so much bad riding on SoCal roads each day, Jason decided to set up a website and rider education center with the aim of improving the skills, understanding and knowledge of Southern California’s motorcycle riders. 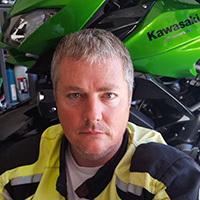 Jason has 17 years’ riding experience in Europe and North America, and currently holds a Gold standard RoSPA Advanced Riding Certification plus full UK Category A and USA M1 motorcycle licenses.